Weekend breaks, courses, tuition and adventure holidays in Snowdonia, North Wales. 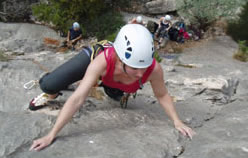 Activities include coasteering, rock climbing, hill walking, mountain scrambling and ice climbing For individuals, couples and groups, from absolute beginners to experienced walkers and climbers. Highly qualified, experienced and friendly local instructors. A range of accommodation to suit your budget.